The 2016 campaign has raised major questions among Republican lawmakers and senior party officials about the future of the GOP. But how do Republican voters feel about their party? Most Republicans acknowledge the GOP is divided heading into next week’s presidential election, but more view their party favorably than did so as recently as six months ago. 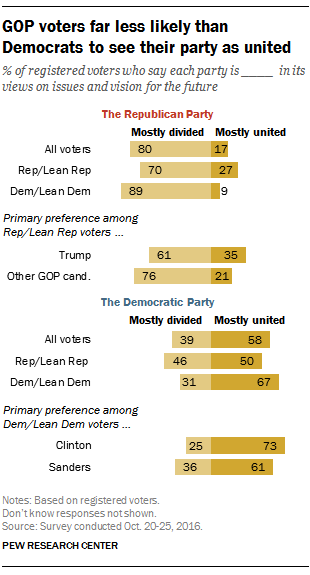 170% of Republicans think their party is divided. In a survey released last week, Republican and Republican-leaning registered voters say their party is “mostly divided in its views on issues and plans for the future.” Just 27% say it is mostly united. The belief that the GOP is divided spans all groups of Republican voters. However, those who supported Donald Trump in the GOP primaries (61%) are less likely to view the party as divided than voters who backed other Republican candidates (76%). By contrast, 67% of Democrats said their party was mostly united, while just 31% said it was mostly divided. 2Most Republicans think Trump represents the GOP’s “core principles.” About two-thirds (65%) of Republican and Republican-leaning voters think their party’s presidential candidate does represent the core principles and positions the Republican Party should stand for while 31% think Trump does not. This stands in contrast with the 83% of Democratic voters who say Hillary Clinton represents the core principles of the Democratic Party. Among Republican voters, conservatives are far more likely than moderate and liberal Republicans to think of Trump as representative of the Republican Party’s principles. While three-quarters of conservative Republican voters see Trump as representative of what the party should stand for, only about half of moderate and liberal Republicans (52%) say the same. 3“Negative voting” is higher for Trump than it was for past GOP candidates. While most Republican voters say Trump does represent the party’s core principles, they are divided over whether they are mostly voting “for” him or “against” Clinton. In our most recent survey, 51% of registered voters supporting Trump say they see their choice as more of a vote against Clinton than a vote for Trump. That is the highest share of “negative voting” among supporters of Republican candidates dating back to George W. Bush’s first presidential race in 2000. Among Clinton supporters, 57% view their choice as for Clinton, rather than against Trump. The share of Clinton’s backers who view their choice positively is less than the share of pro-Barack Obama voters who did so in 2008 (77%) or 2012 (73%), but much higher than the level of positive support for John Kerry in 2004 (39%). 4 GOP voters who supported Trump in the primaries and those who backed one of his rivals differ sharply in their views of him. Republican voters who backed other candidates for the nomination overwhelmingly support Trump over Clinton (79% to 14%), but in many ways are highly critical of him. On all 10 traits and characteristics tested in the survey, Republican voters who did not support Trump for the nomination express less positive views of him, although majorities do view him as patriotic (84%), a strong leader (68%) and honest (56%). Overall, Republican voters are divided over whether Trump is “hard to like” (52% say he is) and a “good role model” (50%). But among GOP voters who supported someone else in the primaries, 71% say Trump is hard to like, compared with just 25% of Republican voters who favored Trump in the primaries. And while 80% of Republicans who backed Trump in the primaries say he is a good role model, just 28% of those who supported other GOP candidates say the same. 5 As Election Day nears, more Republicans feel favorably toward their party. As in past cycles, Republicans’ ratings of their own party have grown more favorable as the campaign nears its end. 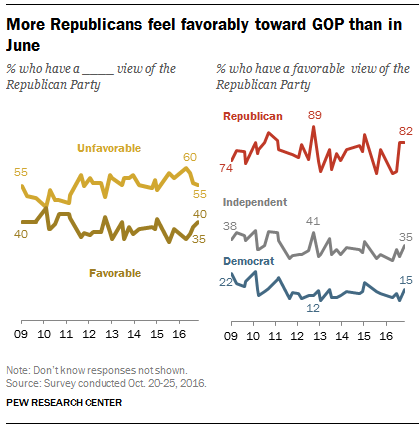 About eight-in-ten Republicans (82%) now say they have a favorable view of the GOP. This positive outlook is up from earlier this year, when the share who rated the party favorably dipped. In June, 69% of Republicans had a favorable opinion, while 28% rated the GOP unfavorably. And while the GOP’s image has improved among Republicans since the summer, there are differences between Trump primary supporters and other Republicans. Among Republican and Republican-leaning voters who backed Trump in the primaries, 84% feel favorably toward their party, compared with two-thirds (67%) of those who backed other GOP candidates. Hannah Fingerhut is a former research analyst focusing on U.S. politics and policy at Pew Research Center.